Goodness gracious! It’s getting to be that time. Time to find some things that start with g so we can practice our g sounds. And here they are! Eight colorful cards with g words. 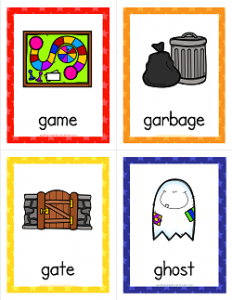 The words (with pictures to go with them) are: game, garbage, gate, ghost, gift, girl, guitar and gumballs. Just a note – these are all hard g sounds. These would be a great asset in language arts or reading centers where kids could practice “reading” the words and making the g sound together. Go to this page to see all the things that start with a-z cards in this set.